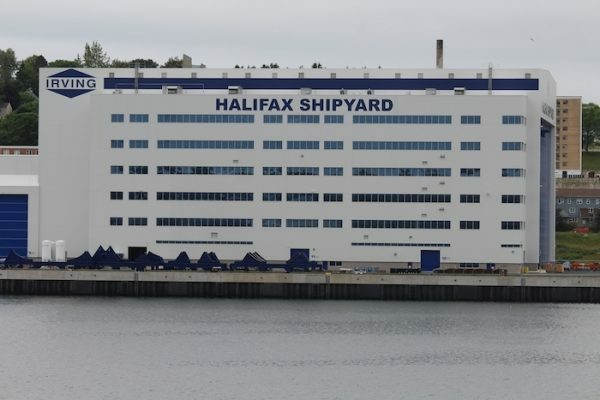 In recent days, Unifor Marine Workers Federation Local 1, which represents Irving Shipyard workers, has been conducting a “Ships Stay Here” campaign that included getting Halifax council to support its efforts. The union fears that some of the shipbuilding work contracted to Irving will be shifted to Davie Shipyard in Quebec. In an emailed statement to The Canadian Press last week, the Department of National Defence spokeswoman Ashley Lemire said the government intends to announce any changes to planned maintenance on Halifax-class frigates in the coming weeks. “Given the planned work for the Royal Canadian Navy, an option with two maintenance and repair facilities to conduct this work beginning in the 2020 timeframe is being considered,” Lemire said. Lemire added that Irving is the prime contractor for the Canadian Surface Combatant project, which she said will result in an estimated $30 billion in build contracts for Irving Shipbuilding into the 2040s. Boisvert says that’s all a bit rich. No one in their right mind could believe there are production gaps at Irving, he says, given the sum total of $65 billion in federal contracts the shipyard has secured. Davie has laid off some 1,000 workers itself over the past year due to dwindling federal contracts. “We’re bleeding people here,” says Boisvert. Both companies have been on a lobbying blitz in Ottawa. Raghubeer has made 32 reportable lobbying contacts this year, 11 of them in September alone (October reports are not yet published). The September contacts include conversations with multiple lobbyist targets at once (the reports don’t say if they were in-person or conference calls), including with MPs Joel Lightbound, Steve MacKinnon, Remi Masse, Michel Picard, Luc Berthold, Steven Blaney, Gerard Deltell, Bernard Genereux, Jacques Gourde, Richard Marte, Alain Rayes, Jean-Yves Duclos (the minister of Employment and Social Development), Marc Garneau (the minister of Transport Canada), and François-Philippe Champagne (the minister of Infrastructure Canada). As well, in September Raghubeer talked with Senators Pierre-Hugues Boisvenu, Claude Carignan, Jean-Guy Dagenais, Larry Smith, Pierre Dalphond, Denis Dawson, Eric Forest, Rosa Galvez, and Andre Pratte. Raghubeer’s September lobbyist efforts also including conversations with a range of political functionaries, including (twice with) Martin Belanger, the Policy Advisor to the Office of the Leader of the Official Opposition; Taras Zalusky, the Policy Advisor to Carla Qualtrough, the minister of Public Services and Procurement Canada; Mathieu Bouchard, a Senior Advisor at the Prime Minister’s Office (PMO); Dominic Cormier, a Policy Advisor to the PMO; John Ma, a Policy Advisor to Harjit Singh Sajjan, the minister of DND; (twice with) Shane McCloskey, a Policy Advisor to Marc Garneau, the minister of Transport Canada; Christina Rettig, a Policy Advisor at the PMO; George Young, the Chief of Staff to Jonathan Wilkinson, the minister of Fisheries and Oceans Canada (DFO); Marc-Andre Leclerc, the Chief of Staff of the Leader of the Official Opposition; Sriram Raman, a Policy Advisor to François-Philippe Champagne, the minister of Infrastructure Canada; Marc Roy, the Chief of Staff to to Marc Garneau, the minister of Transport Canada; Jenny Demers, a Policy Advisor to Jean-Yves Duclos, the minister at ESDC; and Olivier Duchesneau, Chief of Staff to minister Duclos. For its part, lobbying efforts on behalf of Irving Shipyard are conducted by James Irving, the co-CEO of the shipyard. Irving reported 70 lobbying contacts in 2018, but just six of those were in September. Unlike Raghubeer, who speaks with multiple people at once, Irving tends to speak to one or two people at a time. James Irving’s September contacts were with Taras Zalusky, the director of Policy, Procurement and Parliamentary Affairs Public Services and Procurement Canada; John Ma, a Policy Advisor to Harjit Singh Sajjan at DND; Eric Dagenais, the Assistant Deputy Minister at Innovation, Science and Economic Development Canada; John Knubley, the Deputy Minister at Innovation, Science and Economic Development Canada; Elliott Hughes, the Director of Policy at DND; Christina Rettig, a Policy Advisor at the PMO; and Justin To, the Director of Policy at the PMO. It was a disappointing end to a three-year road for Tantallon-area residents. After a public hearing starting Tuesday night and lasting more than six hours, regional council voted just after midnight Wednesday morning to allow a controversial asphalt plant in the community, about a half hour drive west of downtown Halifax. In all, 26 citizens spoke during the public hearing. Of those, 25 were opposed to the plant proposed by Scotian Materials. It’s now approved for four hectares of a 16.2-hectare site just north of Highway 103 between Head of St. Margaret’s Bay and Upper Tantallon. The latest passenger figures for the Yarmouth ferry were released yesterday. Previously, the city of Portland had released monthly totals, but since the sailing season was extended a week, this time the figures include all of September and the first week of October. That five-week reporting period shows a whopping 70 per cent increase over the monthly September-only figure from last year, so while that may be a little misleading, it’s still good news. The bad news is that annual passenger figures, while up, are still a long way from the 60,000 annual passengers goal that the contract with Bay Ferries was premised on. The town council unanimously approved the decision Tuesday, directing Town Manager Cornell Knight to sign the lease with Atlantic Fleet Services Corporation, a local partner of Canadian ferry company Bay Ferries. The lease is set to go into effect Dec. 1. Bay Ferries operated the CAT ferry that ran between Bar Harbor and Yarmouth, Nova Scotia from 1997 to 2009. The five-year lease will allow Bay Ferries to return, though the lease is officially between the Town of Bar Harbor and Atlantic Fleet, which contracts with Bay Ferries to provide shoreside operations for its Maine ferry service. Atlantic Fleet is owned by Annette Higgins of Bar Harbor. The lease will allow the tenant to occupy a portion of the ferry terminal beginning Dec. 1 for an annual base rent of $69,000 in U.S. dollars, plus passenger, vehicle, and bus fees. The lease contains a “province guarantee” that payments are guaranteed by the Province of Nova Scotia. I can’t find any news reports this morning that mention any costs related to moving U.S. Customs operations to Bar Harbor; those costs could be considerable, and would likely be borne by the Nova Scotia government. Bay Ferries has long wanted to move the Maine terminus for the ferry from Portland to Bar Harbor because operating costs would be less on a shorter ferry route, and because Portland has barred the ferry on a handful of the busiest days of the season in favour of competing and more rewarding cruise ship traffic. But while the move makes financial sense for Bay Ferries, it’s not clear how it will affect passenger numbers. A shorter ferry route might be good for Yarmouth, as (depending on the scheduling) passengers might arrive in town in time for supper. Rhodes details the claim at the link… I don’t see it going anywhere, but who knows? MacKinnon, past president and vice-chancellor of the University of Saskatchewan, is a Dalhousie alumnus (BA’69, History and Political Science) with Maritime roots, having grown up in Prince Edward Island. He served as a faculty member, dean of the College of Law and acting vice-president academic at the University of Saskatchewan before serving as president from 1999 until 2012. There was news about cannabis. You may have heard. You can find all the federal government’s various reports on cannabis demand, supply, price, and pretty much everything else you would want to know, here. Jean Laroche confirms what I’ve already reported: you can legally get high with the murderous imperialist Boer War dude at Province House. Active Transportation Advisory Committee (Thursday, 4pm, City Hall) — no action items are on the agenda. Molecular and Cellular Dynamics of Cardiac Arrhythmias (Thursday, Room 3H1, Tupper Medical Building) — Alvin Shrier from McGill University will speak. Climate Change, Sustainable Development and Human Rights (Thursday, 7pm, Ondaatje Hall, Marion McCain Building) — Alan Boyle from the University of Edinburgh will talk about all that stuff nobody much cares about. Getting Old on a Jamaican Plantation: Age and Slavery in the Colonial Caribbean (Friday, 3:30pm, Room 1170, Marion McCain Building) — Daniel Livesay from Claremont McKenna College will speak. The Basics of Conflict Resolution (Friday, 9am, Room 523, Collaborative Health Education Building) — register here. This talk describes the polynomial analogue in b variables related to the Stern number sequences which interpret the number of ways to write a positive integer as the restricted sum of powers of integer base b. We present recursions and generating functions for these polynomials which explicitly specify those hyper b-ary representations. Lucas sequences, like those of Fibonacci and Pell, are identified within the generalized Stern number sequences. Then as polynomial analogues, the continued fractions associated with the Lucas sequences are expressed as ratios of their corresponding polynomials. Finding function in noncoding RNAs and noncoding variants (Friday, 4pm, Theatre A, Tupper Medical Building) — Chris Ponting from the University of Edinburgh will speak. Haunting the Twentieth Century (Friday, 2pm, Keshen Goodman Library) — Karen MacFarlane will speak. Sixty per cent chance of flurries today, says Enviro Canada. “StatsCannabis”. Well played, StatsCan, well played. Councillor Cleary pointed out that there is a lot of suburban sprawl near the soon to be built asphalt plant. And a lot of asphalt driveways, many 100 feet long. And a lot of 2 car garages.. The turnout was very low considering the hundreds of homes to the east and south. What about the other “murderous imperialist Boer War dude” up on Spring Garden Road? I haven’t heard a peep about him, despite the recent controversies on Twitter. I’m fine with both of them (including smoking dope next to them).